Background:The purpose of the Effectiveness of Diabetes control with vildagliptin and vildagliptin/metformin (EDGE) study is to compare prospectively the effectiveness and safety of vildagliptin with other oral antidiabetic drugs (OADs) in patients with T2DM inadequately controlled by monotherapy, in real life conditions across 5 regions worldwide. Methods:After the add-on treatment was chosen by the physician, based on the patient need, subjects were assigned to one of two cohorts: (i) vildagliptin or (ii)other OADs including any sulfonylurea, thiazolidinedione, glinide, or α-glucosidase inhibitor or metformin. The effectiveness was assessed by means of a composite endpoint including the proportion of patients responding to treatment (HbA1c drop >0.3%) without peripheral oedema or proven hypoglycemic event or discontinuation due to gastrointestinal(GI) event or significant weight gain (≥5%) after 12 months of treatment. Results:Overall, 45868 patients in 27 countries across the world were enrolled and assigned to a treatment cohort (N=29759 in vildagliptin and N=16078 in the comparator. The mean baseline HbA1c was 8.2% in both cohorts. The probability of success was higher for vildagliptin, overall and in every region regardless of baseline HbA1c and second drug chosen by the physician in the comparator arm. Overall, 55.4% and 51.3% of patients in the vildagliptin and comparator cohorts, respectively, had decrease in HbA1c>0.3% without peripheral oedema, hypoglycemia, GI events and weight gain after 12 months of treatment (Unadjusted OR 1.18 [95% CI: 1.13; 1.22]). 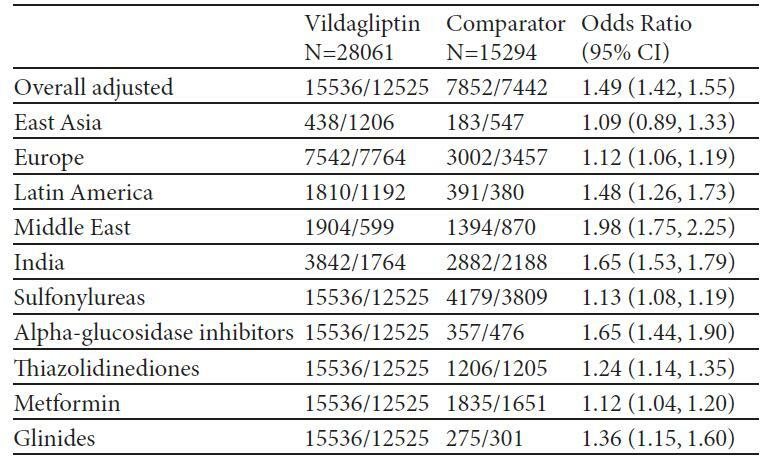 Overall, 2383 (5.44%) adverse events were reported: 1503 (5.28%) in vildagliptin and 880 (5.73%) in the comparator cohort. Conclusions:The proportion of patients responding to treatment (HbA1c drop >0.3%) without tolerability issues was higher in the vildagliptin than in the comparator cohort in every region of the world considered, regardless of HbA1c at the baseline. The proportion of reported adverse events was similar in the two cohorts.